Wow! Why didn’t I think of that? Well, Irish medicine has done me no great favours anyway, so no surprise there. Maybe this young doctor can help? 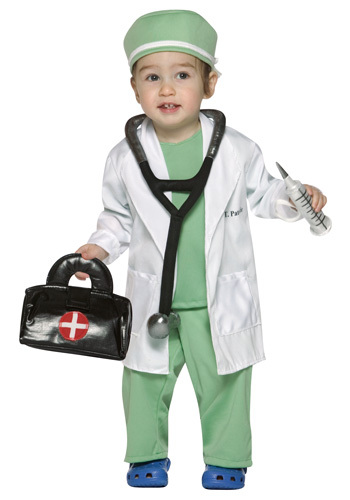 Image from nursecostumes.com. But I’ll outline my other personal medical details here should any open-minded medical expert who may wish to help me read this. From 2006 till September, 2011 I took Bonviva monthly (biphosphonate). In light of the new FDA concern over long-term use of biphosphonates, I’ve now stopped and switched fully over to the most natural treatment of all – diet, courtesy of the marvellous Vivian Goldschmidt MA at Save Our Bones. I still take a calcium supplement. I stopped smoking over a year ago but I do use an electronic cigarette. It’s not cancerous apparently, based on a physical examination. I take Xatral which has reduced the frequency of night-time bathroom visits. I’ve also been prescribed Vesitirim, an anticholinergic, but I stopped it because it interfered with the Kemadrin, another anticholinergic. Lipitor gave me severe muscle pain so I take Ezetrol plus daily Flora Pro-Activ (yoghurt drink with plant sterols). Update: I no longer take anything for this because I now believe that “high cholesterol” is another fake problem foisted upon us by medicine and the pharmaceutical companies - just as osteoporosis is not an actual disease per se but rather a statistical increase in fracture risk. As I’ve written elsewhere, the undetected osteoporosis led to a compressed vertebral fracture. This, too, was undetected by Beaumont Hospital Radiology Department because a chest x-ray had been requested. My family doctor diagnosed soft tissue injury and thought a course of private physiotherapy would help. I attended weekly for two months. Naturally, the physio worked on the source of the pain – my fractured spine. The Mater Misericordiae Hospital Radiology Department finally found the injury – two months too late to do anything about it. The physio told me I was lucky she didn’t paralyze me. So I’ve been a patient at the Mater Hospital’s Department of Pain Medicine since 2004. I’ve had four epidurals, three facet block injections, a course of ketamine/lidocaine infusions, and every painkiller under the sun, including a TENS machine and lidocaine patches. All failed. If I walk for more than 5-10 minutes, I end up in agony. If I stand for more than five minutes – agony. If I sit at a computer or musical keyboard for more than 10-15 minutes – agony (this website has taken a long time to put together). To make the pain subside, I have to lie flat on my back for at least 15 minutes. I can no longer bend over to touch my toes because of the likelihood of damaging my lumbar spine due to spinal degeneration. Consequently, I haven’t been able to do any work at all since January, 2010. After seven years of trying everything, my pain consultant has now told me I won’t be able to work again. So mobility and flexibility are big problems for me. A frozen right shoulder that never regained its full range of movement hasn’t helped either. I may yet write again (if I can beat the tickles) by using my iPad with dictation software while lying on my back. But I think my music career is definitely kaput. The only medication I can take for pain is paracetamol. Great, huh? So I’m now in the process of applying for an Invalidity Pension. All these problems are bad enough, but add in the tickles and the inability to sleep properly and I’m simply overwhelmed. Sona Multiplus Vitamins and Minerals. Sona Vitamin E to improve circulation and capillary flow. Sona Cal/Mag (calcium and magnesium combined). I’ve lost the little faith I had left in conventional medicine. Homeopathy worked for me with the “chronic” eczema, so I’m hopeful it can work again with another skin complaint. I don’t know yet since I haven’t started down that road yet. One article I read on the web said that homeopathy wasn’t effective for demodicosis. Or, indeed, for delusional parasitosis. But it was written by a doctor, and most doctors would say that anyway. I’ve located one good homeopath who holds a clinic near to my home. Homeopathy is now my only hope. Unless one of you can help (and you have - please see the “Help Yourself” pages).